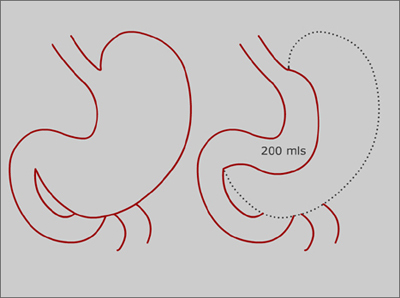 The Sleeve Gastrectomy procedure involves removing the lateral 2/3rds of the stomach with a stapling device. It is usually done laparoscopically but is not reversible. It basically leaves a stomach tube instead of a stomach pouch. The residual stomach capacity is about 200mls so a generous entree should be possible.